Which mistake I did that if one form get filled, that I recieve an email of all forms I did?????? And how to change this, as it is very confusing. 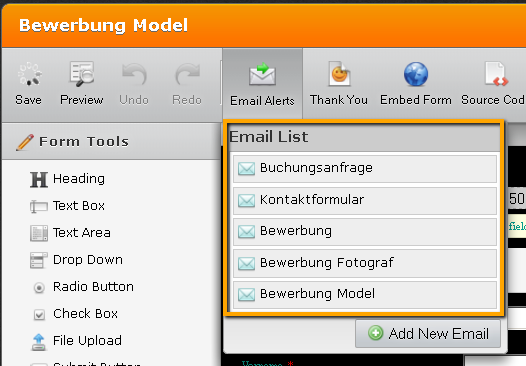 Usually, only one email notification is enough even if you need to send the notification to multiple email addresses. Kindly confirm if you need all of these notifications and delete those that you don't need. Thanks for your help. So I will try my best. But still don't understand how this works. I am in planning to use 3 different mail-ID's to submit the forms. So if I use 1 mail-ID for a group like enrollments, do I get the eg model-, photographer-,stylistenrollment submit also if there was just filled out the make-up artist form?? Because this is happening now. Okay I got it. The e-mail lists are actually the recievers.. and as I had there everywhere the same but just an other title i got it this much often.